This package contains a 6 pack of broom heads. Each Seabrook™ push broom is 24 inches long and contains palmyra bristles that long wearing and durable. They perform particularly well on wet and dry floors. A truly universal rough brush that is great for all types of sweeping. If you'd like to add a handle, we recommend the wood threaded broom handle along with the push broom stabilizer kit. These broom heads may be economical in price, but the quality is top notch! The wood block is extremely durable, and comes with 2 threaded holes for sweeping in both directions as your bristles start to wear. It also doubles as a heavy scrub/scrap block for loosening those really tough soils. This listing is for a pack of 6 push broom heads. Please take a look at our complete line of push brooms for other sizes and bristle types. Customers who were interested in the 24 inch Seabrook™ Rough Sweep Palmyra Bristle Push Brooms - 6 Pack were also interested in the following items. 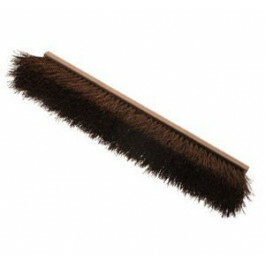 This is a review for the 24 inch Seabrook™ Rough Sweep Palmyra Bristle Push Brooms - 6 Pack.